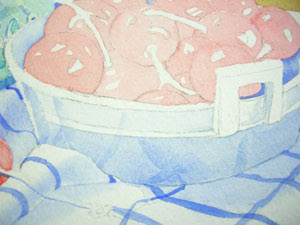 Today I am continuing to use French Ultramarine Blue to develop the subtle light effects in the glass. I have added some very wet pigments to the jar, and to the white bowl. Notice how the towel reflects into the shiny glass. Keep the applications light and wet. Use both crisp and soft edges, letting your reference be your guide. 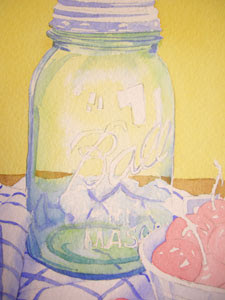 In the canning jar, I painted the shadows on some of the letters. It is very crucial to not allow yourself to get too literal here. Pick out one value, the darkest value, and don't allow yourself to work in any lighter values yet. You also don't have to paint everything you see. This is where the artist in you will learn to filter out what is necessary to the painting and what can be left out!